My YouTube channel generates an additional $3,000 to $5,000 each month in sales for my online course. I’ll give you a step by step guide to copying my process for growing your audience and generating online course sales with YouTube. Note – I shared a draft of this post with a few clients and within a few days they saw great results including increases in YouTube engagement and course sales. Also, I’ve put together a short checklist / summary to keep you on track. Get the Checklist here. In order to help you through this I’ve put together a quick summary checklist. It doesn’t cover everything in these articles but it’s a handy reference guide to keep you on track. First let’s look at a few things about YouTube and why it makes a great marketing platform for online courses. YouTube is the second largest search engine. Next to… you guessed it, Google. YouTube sees over 3 Billion searches a month and while many of those are for cute cats or gangnam style videos plenty of them are people looking to learn something. This gives you an opportunity to share some knowledge on YouTube, which can then drive visitors to your actual online course. 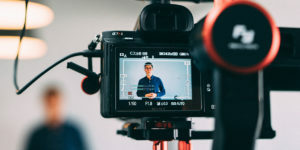 Not only is YouTube bigger than Bing, Yahoo!, Ask and AOL combined, (when it comes to monthly searches), your videos will also show up in regular Google searches. So if your training videos are on YouTube, people searching on YouTube, or regular Google search can find them. We’ll start by looking at the general strategy for posting on YouTube, and driving leads from YouTube to your course and then I’ll give you essential steps to get better exposure on YouTube. What I won’t cover in this article is paid advertising. That’s not to say paid video ads aren’t a great way to promote your videos and get more views and sales. For this discussion we’ll focus on maximizing your free YouTube Marketing Strategy. What we’re going to focus on here is some clear steps you can take to increase your YouTube views and, as a result, your Conversions. Let’s dive in and learn about increasing your exposure and sales with YouTube – a Step by Step approach. Next up… Part 2: Increasing the Exposure of your YouTube videos. I hope you’re getting value out of this! It would mean the world to me if you took a few moments to share it! Thanks for your generosity and thoughtfulness in sharing this information, Greg. As always it is cogent and concise. I can hardly wait for the rest of the series! Or was there other video you were looking for?